The UIAA tests equipment to determine which gear meets its standards. In a sport where equipment failure can be fatal, it's wise to purchase equipment that has earned UIAA approval. A principal UIAA test checks the strength of single ropes, the basic ropes used in most climbing. These ropes generally measure between 9.8 and 12 millimeters in diameter. 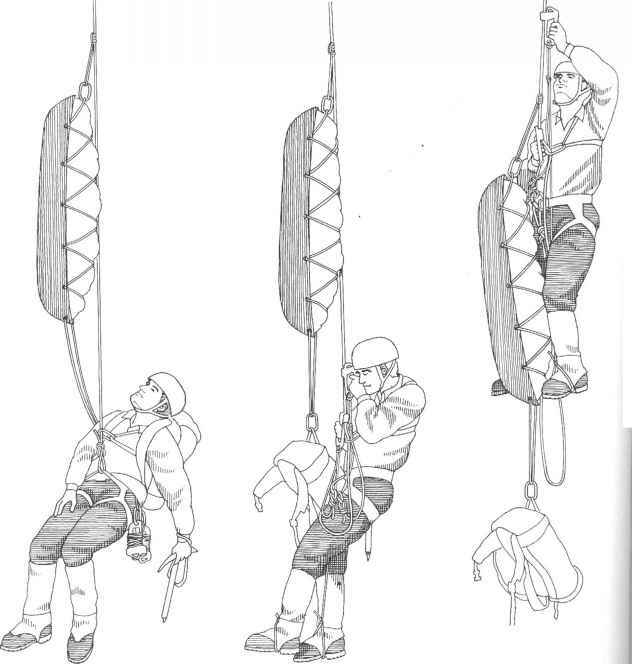 For the test, the UIAA attaches an 80-kilogram (176-pound) weight to one end of a 2.8-meter (9-foot) length of rope. 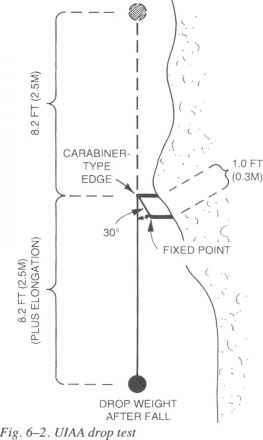 The other end is attached to a fixed point after passing through a carabiner-type ring about 1 foot above the point of attachment. The weight is raised as high as it can go, which puts it 2.5 meters above the ring, and dropped for a free fall of 5 meters (fig. 6-2). The test mimics a severe real-life climbing fall. To receive UIAA approval, a rope must survive at least five of these falls. The test also measures the impact force of the rope, which determines the stress of the fall on the climber's body and on the pieces of protection. UIAA standards require that the impact force not exceed 1,200 kilograms (about 2,700 pounds) on the first fall. diameter. The test for any individual rope used with two-rope technique is identical to the test for single ropes, except that a weight of only 55 kilograms (121 pounds) is used. Each rope must survive at least five falls, and the maximum permitted impact force on the first fall is 800 kilograms (about 1,800 pounds). The UIAA also applies static tension tests to the ropes it approves, to keep rope stretch below a certain maximum. A load of 80 kilograms is applied to a 1-meter section of rope. A larger rope (between 9.8 and 12 millimeters in diameter) cannot elongate by more than 8 percent. A lighter rope used in two-rope climbing cannot elongate by more than 10 percent.